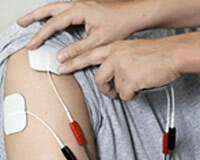 Physical therapy is a non-invasive form of treatment for painful conditions. It incorporates exercise with posture and body mechanics training to correct dangerous movement patterns that cause injuries. The goal of physical therapy is to rehabilitate injury by rebalancing posture into a neutral position, while gaining range of motion. When individuals are recovering from injury or disease, the physical therapist evaluates and directs the recovery process to relieve pain, promote strength training, and help regain function. Physical therapists also instruct patients and their families how to facilitate healing and recovery at home. Besides aiding recovery, physical therapists also promote wellness and injury prevention. They teach the importance of personal fitness and explain how to prevent injury at work or at play. Physical therapy attempts to meet an individual's health goals, whether a patient's goal is walking without assistance or running a marathon. A physical therapist is an integral part of our healthcare team that makes these goals a reality. Physical Therapy is the treatment of physical dysfunction or injury by the use of therapeutic exercise and the application of modalities intended to restore or facilitate normal function of the body. Instruct in home exercise programs to maintain strength and flexibility and prevention of future occurrences.